Lenovo today, Asus tomorrow. How will PC makers fair in a Post PC World? There have been a whole slew of earnings reports as consumer electronics companies report on their efforts to win hearts, minds, and wallets from consumers in 2013. Lenovo announced better than expected earnings and bold predictions for the future as they court investors with a blend of caution and temptation after two major acquisitions. Our analysis of their performance with North America consumers confirms what the market already knows, that Lenovo has significant untapped potential with consumers. The graph below shows their performance in line with Acer and well below the market gorillas of Apple and Samsung. 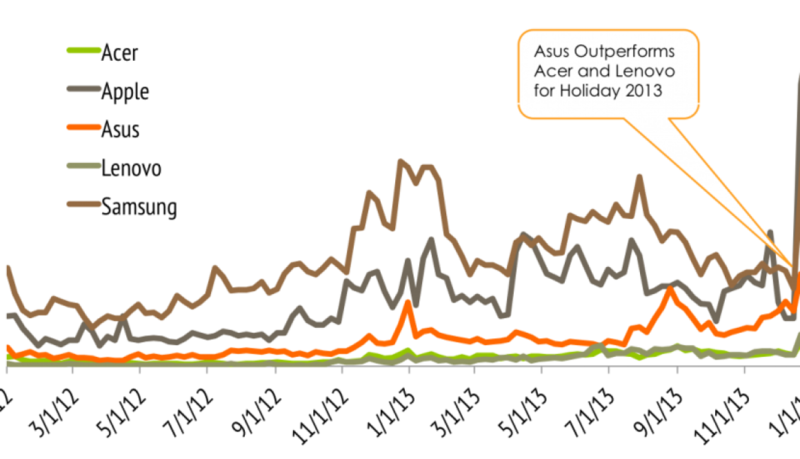 Asus outperformed both Acer and Lenovo during Holiday 2013, suggesting positive news when they announce earnings on 14 Feb 2014. Question is, how will Asus fair when they announce earnings on 14 Feb 2013. Our assessment is that Asus will do better than expected given the strong showing over holiday. We realize that the US market is not the only one that matters to these global purveyors of consumer technology and believe a strong Holiday 2013 can only help. Increasingly Asus products have been successfully positioned as less expensive alternatives to Apple and Samsung products. This has been driving in part to increased demand for Asus convertibles over other 2-in-1 laptop/tablets and larger demand for Asus tablets over the holidays. As Asus, like Lenovo, seeks to bring their smartphones to the US market (maybe they should look at buying BlackBerry…) this will only add to their share of US wallets, if they can differentiate against the other players. ZTE and Samsung are already playing to win in the low price smartphone segment. With Asus moving in, there will be blood in the water and hopefully smiles on the faces of consumers. You see, Argus Insights got into the big data business by accident. Initially our most compelling insights came from the analysis of consumer reviews. Over time our clients asked us to take the talents honed in pulling actions from the rants and raves of consumers and apply them to the growing proliferation of social media, Twitter, Facebook posts, etc. Like good soldiers we dived right into the mix, eventually developing the means to extract value from the vast landscape of social media. Our initial efforts to separate wheat from chaff produce small piles of waste that we dutifully stored for later study. Then we did a brand audit for one of our retail customers. To our shock, one in three social mentions of our client contained a like to Amazon.com. Their brand was being hijacked! Before you decide that this post is about attacking Amazon for surreptitiously snagging mindshare from our clients through a well thought and illicit campaign of consumer kidnapping, I have to share that each one of these links was actually a link to an Amazon affiliate designed to guide consumers back to Amazon for a purchase where the erstwhile affiliate would be rewarded for their ingenuity. This was starting to be an issue our clients and by association, we could no longer ignore. It came to a head during Black Friday 2012, when an Amazon Affiliate by the name of Bob Douplein found a way to get legitimate Facebook users to help him repost the entire Amazon.com catalog one public post at a time. At one point in time, if you searched for Bob Douplein, you found over 14 million hits because Bob adhered to the Amazon requirement that affiliate be part of every post. Why did Bob do this? Since Facebook is so heavily indexed by Google and Bob wanted his links to the 25,673th pink leather iPad case to come up at the top of your search results, he, or his agent, cleverly found a way to get the attention of Google’s bots. Eventually such a single line of attack was discovered and Bob’s Facebook legacy was removed. If you search for him today, there are less than 50,000 posts. But Bob started something, he showed where the market was headed when it comes to the competition for consumer attention. One a single day during the holiday season we pulled in almost a million Facebook public posts related to the aforementioned retail client. We threw away (identified as spam with a pretty high threshhold algorithm) over 70% of these posts. We routinely filter out 20% of all tweets as bot traffic trying to boost the page rank of their shady masters. A cry that has increasingly rung through the office, “We’ve got another Facebook spam storm!” The spammers are getting smart, they are using spread spectrum attacks to stay under the radar of Twitter and Facebook. Eventually these attacks are rooted out but with significant cost to the entire social media ecosystem. Twitter recently announced both profitability and lower usage by users, a mixture of hot and cold that left the markets a bit frigid on Twitter’s future prospects. So the question is, why are Twitter, Facebook and those of use that depend on the social media ecosystem to understand consumer behavior subsidizing Amazon affiliates abuse of Google? Lithium to buy Klout after buying Scout. Should consumers Pout? Lithium reportedly buys Klout for a whopping $100 million. Wow. Why? Klout has been working hard to measure the unmeasurable since their founding, our collective social influence. Klout recently rolled out new engagement and discovery tools that rhyme with Lithium’s earlier acquisition of Scout Labs so there is an interesting question of redundancy. Scout Labs founders eventually left and now are turning heads with a powerful marketing metrics company, Beckon. Is this an aquhire for Lithium? In part yes, Klout has some amazing design talent that could round out Lithium’s offerings. In reality, I think Lithium is buying the powerful dataset that Klout has been building over the years, connecting the dots between users different social channels. Klout knows who I am in LinkedIn, Facebook, Twitter and any other social media platform I care to share with them. It’s the largest collection of fused consumer identity information outside of the government. Klout knows who we are, what we say, and to whom across all public channels. Consumers willingly gave over this information to know what our score was, like those compatibility tests we all took in middle school. Question is, what will Lithium do with this treasure trove? Do they have the vision and resources to leverage these powers for the good of consumers and their corporate clients? Only time will tell. Sprint Reports Fourth Quarter and surprises Wall Street with lower losses than expected. Argus Insights was not surprised. We track consumer behavior across multiple channels, including social media. Not only did we see that Sprint had the biggest lift of all the carriers during Q4 but saw Sprint almost return to holiday 2012 levels of consumer engagement. As you can see from the normalized data below, Sprint consumer engagement, though lower than Holiday 2012, continued at a higher level than their competitors. Based on our analytics, investors would have expected a significant shift in Sprint’s performance weeks ahead of Sprint’s earnings announcement. As much as the equities market is driven by investor speculation in the short term, whether or not Sprint has an increasing number of satisfied customers is the most important leading indicator of their performance. 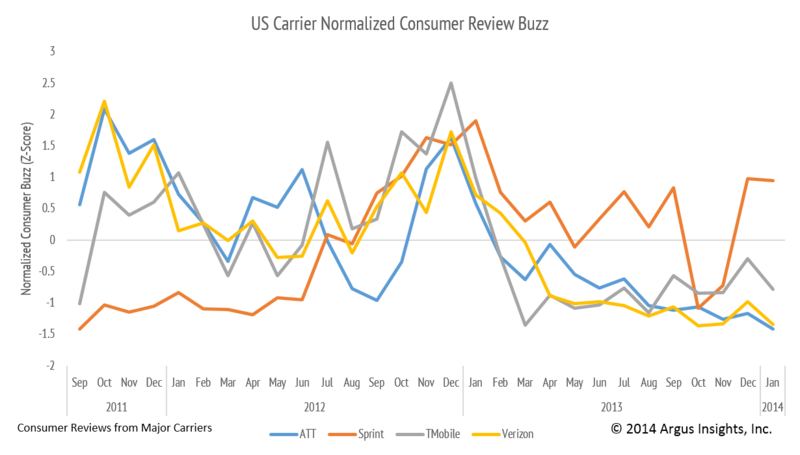 Leverage our metrics of consumer behavior, investors can stay ahead of the market shifts. Already we see that T-Mobile has gained mindshare over their competition in a material way, an indication that the antics of their CEO is doing more than just grabbing headlines, but grabbing subscribers too. We will seen next week if the consumer data holds the same insights for T-Mobile as it did for Sprint. When taking a chance on the market, Argus Insights always bets on the consumer. If you’d like to get a free weekly snapshot of the mobile market, please sign up here. For a sample of our detailed analysis on the mobile market we publish on a monthly basis, download a copy of the report here. 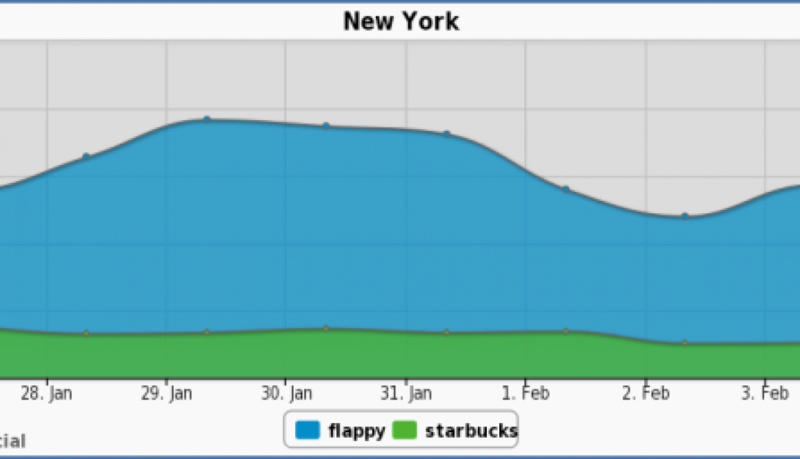 Flappy Bird Has More Mindshare than Starbucks in NYC, Dallas, and Silicon Valley: Why Quit? Not since the Angry Birds has a game captured the imagination of the world population like Flappy Bird. Now the developer is taking it down. I’m sure he has his reasons but it seems odd in the face of such viral popularity or rage as the case may be. We were doing analysis of our cities data for another project when Flappy Bird showed up in the results. Upon deeper checking we found that Twitter users shared more about Flappy Bird than the most popular brand to show up in the data, Starbucks. Granted, most of this is trash talk but still to create a user experience so extreme to snag this much mindshare in the market is a feat by itself. Maybe Starbucks should partner so customers can flap while waiting for their frappe? Let us know if you’d like to see what else is consuming mindshare for consumers. We have the data and the tools to identify and track what is driving consumer behavior.